Can we understand torture by focusing on the torture chamber or even on the states in which it is practiced, or do we have to consider the wider political context in which it is embedded? This is the central question of this book which explores concepts of state crime for understanding and responding to the indirect use of torture by external nation states. Drawing on the cooperation between France and Argentina in Argentina's Dirty War, this book explores the utility of the concept of state crime for understanding and responding to the indirect use of torture by external nation states with a detailed examination of the exportation of torture techniques and training expertise as complicity in torture. 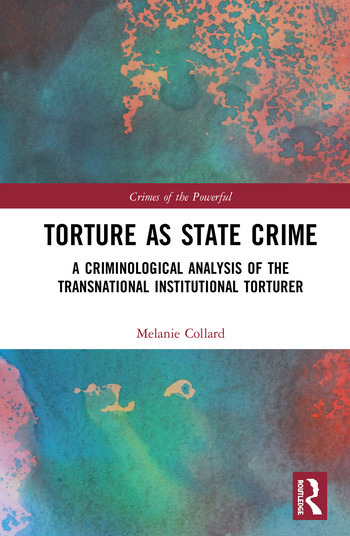 Discussing the institutionalisation of torture in its international structural context, this book focuses on examining three alleged manifestations of the torturer: direct perpetrator, institutional perpetrator, and transnational institutional perpetrator. Important reading for those in the fields of criminology, sociology, international relations and human rights law, this book will also be of key interest to scholars and students in the areas of state crime, human rights and imperialism. Melanie Collard is a Senior Lecturer at the School of Law, University of Hertfordshire, UK.